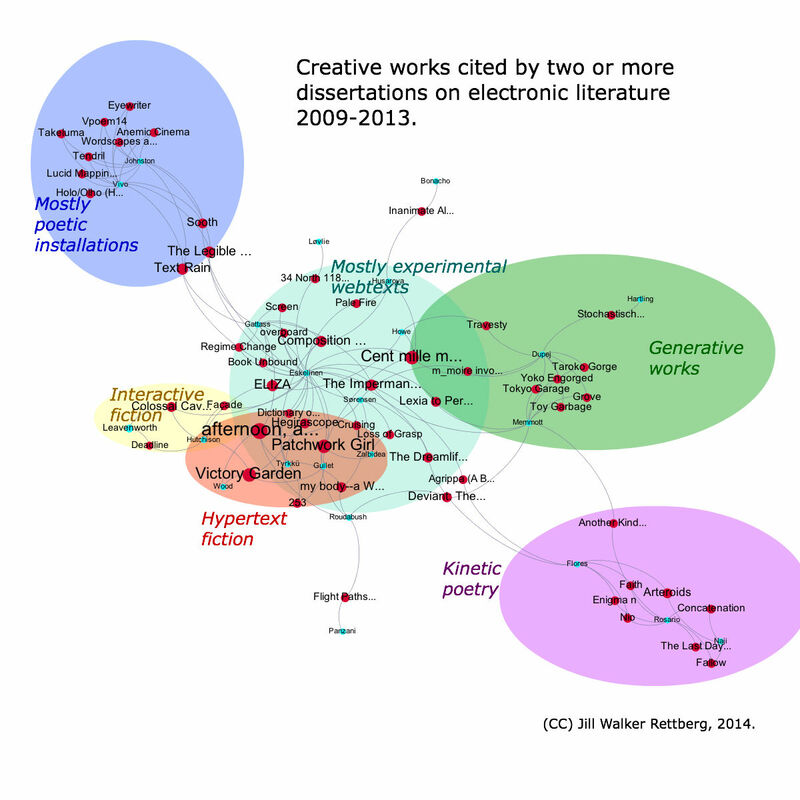 These two visualisations show the shift in the kinds of works discussed in dissertations on electronic literature. 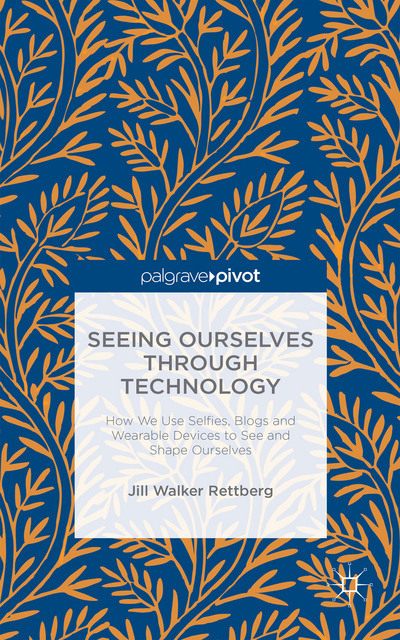 There’s been a clear movement towards digital poetry and also towards more specialized dissertations that discuss a single subgenre. 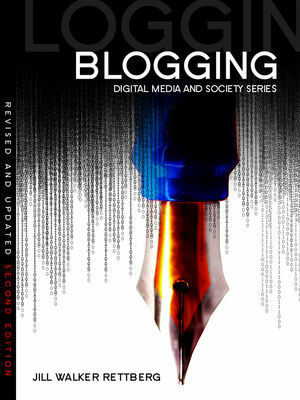 The analysis will be in the revised version of my ELO2013 paper on this that will be published in EBR next month. The picture changes significantly in the next batch of dissertations, which was published between 2009 and 2013. 24 dissertations are included here, and as in the other graphs, you can see the dissertations in blue. There are more distinct groups of work here, and two clear groups of poetry. In the upper left we see a lot of poetic installations. Jeremy Shaw’s The Legible City (1989) and Romy Achituv and Camille Utterback’s Text Rain (1999) are bridge between the web texts and these works, which as you can see are connected largely because they are discussed by both David Jhave Johnston and Fabio de Vivo in their 2011 dissertations. 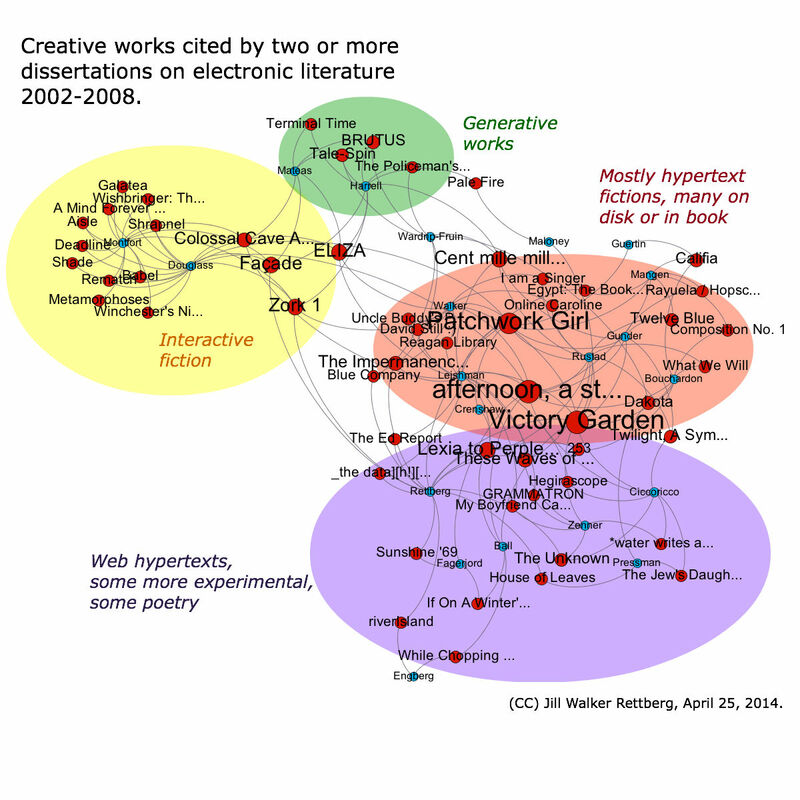 The fact that just two dissertations can make such a clear “genre” or at least cluster appear shows both strengths and limitations of this method, of course. We also see that interactive fiction has shrunk, though it remains a clear grouping. Leavenworth and Hutchison wrote dissertations on IF in this period, but did not cite works as prolifically as Montfort, Douglass and Mateas, so not as many individual works show up.